Argentine investigators developed a non-invasive method of early diagnosis for pathologies difficult to detect and with a mortality rate of 80 percent in some cases. Marcelo Kauffman, investigator at CONICET. Photo: CONICET Photography. Ophtalmoplegia – inability to move the eyes -, convulsions, dementia, lack of coordination in body movements and hearing decline are some of the symptoms that characterize mitochondrial encephalomyopathies that affect four of 10.000 individuals. They are associated with defects in mitochondria, small organelles in charge of producing the energy the cell needs for all vital processes. As most of these pathologies have been described recently, they have not appeared in medical textbooks yet. Their diagnoses are complex and, many times, based on invasive methods, such as muscle or any tissue biopsy. However, CONICET investigators presented a study where for the first time advanced molecular techniques are applied to detect these pathologies. The team used massive pyrosequencing, a method that from a blood sample allows determining DNA sequencing of cell nucleus and mitochondria, the only organelles with own genome. As mitochondrial disorders can be originated from mutations of the two types of DNA, it is essential to know where the error in the sequence is in order to identify the pathology. These mutations affect the organelle’s structure so the energy production, which is vital for the cell to work, is faulty. So far diseases have been diagnosed in laboratories in two ways basically. “On the one hand, muscle samples are studied to see the shape of the mitochondria and determine if they are affected. In other cases, scientists use inmunohistochemical techniques that evidence the dysfunction of specific enzymatic complexes which work inside the organelle”; Marcelo Kauffman, assistant investigator of CONICET and one of the authors of the work, which was published in a specialist journal Molecular Biology Reports, explains. This investigation opens the door not only to doctors, since it allows specialists to identify the clinical diagnosis quickly but also for patients that do not need to undergo invasive or painful tests. 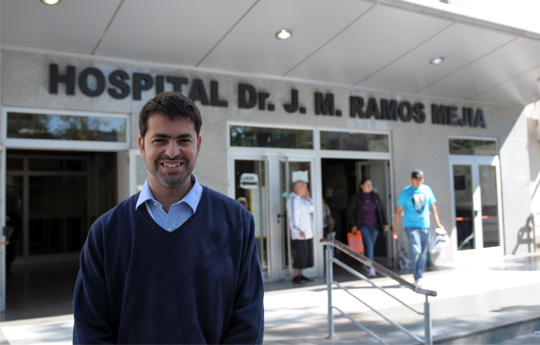 “Mitochondrial diseases are difficult to diagnose because there is not a unique test to detect them and specialists have to deduce, as detectives, what type of pathology it is through varied analysis and enzyme markers that work as indicatives only”, Hernan Amartino, head of Paediatric Neurology of the Austral University Hospital, comments. According to Amartino, there are not specific treatments for mitochondrial disorders nowadays. However, through the use of certain medications and dietary changes, complications could be prevented and the cellular energy function can be improved. As a result, early detection might boost the patient’s quality of life. “In this regard, new sequencing technology allows to make a molecular diagnosis and recognize new syndromes apart from checking classifications we thought to be stagnant”, Kauffman states. Since these pathologies affect the energy production of different types of cells, their clinical manifestations are varied. Amartino explains that the most affected tissues are those with high energy consumption such as muscle, brain and heart. “The mitochondrial encephalopathies, myopathies or heart diseases are the most frequent. But, there are clinical conditions that affect other organs, for instance the kidney, endocrine glands or the bone marrow and they cause diabetes or anemia of mitochondrial origin”, he adds. Besides, there are some reported cases where the alterations in these organelles have a role in pathologies related to ageing such as cardiovascular problems, Parkinson’s disease or dementia. Currently, between eighty and one hundred mitochondrial disorders have been described. They can be attributed to nuclear or the organelles’ DNA mutations. Both codify for proteins that are part of the mitochondria’s respiratory chain, the process in charge of producing energy. The investigators worked on the case of a patient with MELAS, acronym for Mitochondrial Encephalomyopathy Lactic Acidosis and Stroke-like Episodes. This disease affects the brain and the nervous system and includes symptoms such as weakness and muscle pain, migraines, vomiting, dementia and epilepsy. “The most frequent mutation associated with MELAS has a prevalence of 1% in the general population but not all develop the disease because their clinical presentation is variable”, Kauffman analyses and adds that this is related to the energy usage of each tissue. As muscles like the heart need large quantities, others, such as the bone, need little. The investigator explains that the emergence of many of these pathologies could be triggered by situations where extra amounts of energy are consumed, such as infections or physical exercise. That is the reason why being able to detect mutations associated with these disorders could contribute to early diagnosis and the patient’s treatment as well as behavioral changes that can aggravate the condition. Marcelo Andrés Kauffman. Assitant investigator. IBCN. Dolores González-Morón. JM Ramos Mejía University Centre for Neurology. Damián Consalvo. JM Ramos Mejía University Centre for Neurology. Raúl Rey. JM Ramos Mejía University Centre for Neurology. Silvia Kochen. Principal Investigator. IBCN.